I’m not American, as I’m sure you’ll have picked up by now if you’ve popped over here a few times before. Which means that I don’t know an awful lot about Thanksgiving. In fact I’ve only ever eaten one Thanksgiving meal in my whole life, when I had the privilege of joining my friend’s family in Paris for their celebration. But from what I do know about this very American of celebrations, it’s a fabulous holiday that I truly wish I could take part in every year. And the FOOD. Oh, all that wonderful FOOD! Now I don’t have a turkey recipe for you today, or anything else traditionally eaten at Thanksgiving (I’m sure you’ve got your recipes all ready by now anyway! 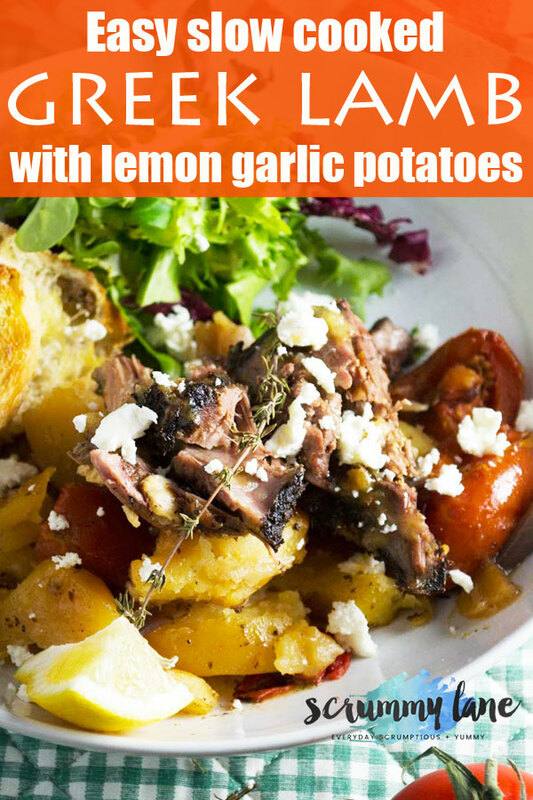 ), but what I do have is a meal that’s equally as deserving of featuring on a table for a special occasion… this amazing Greek lamb with lemony garlic potatoes – otherwise known as lamb kleftiko. I never used to be a big fan of lamb. After my first bite of slow-cooked, melt-in-the-mouth Greek lamb during my years in Greece, however, I was hooked. Whether it’s cooked slowly on the spit or slowly in a pot, it’s fall-apart delicious – especially when paired with all the other wonderful flavours in this recipe. Now this isn’t the sort of recipe you can pop in the oven and have on the table an hour later. But it IS very hands-off once you’ve chopped your ingredients and thrown them into your pot along with your lamb leg. Which means it still firmly deserves a place on this uncomplicated little blog of mine. Spend ten or fifteen minutes rubbing a few flavours into your lamb and preparing your potatoes, garlic, onions, and tomatoes. 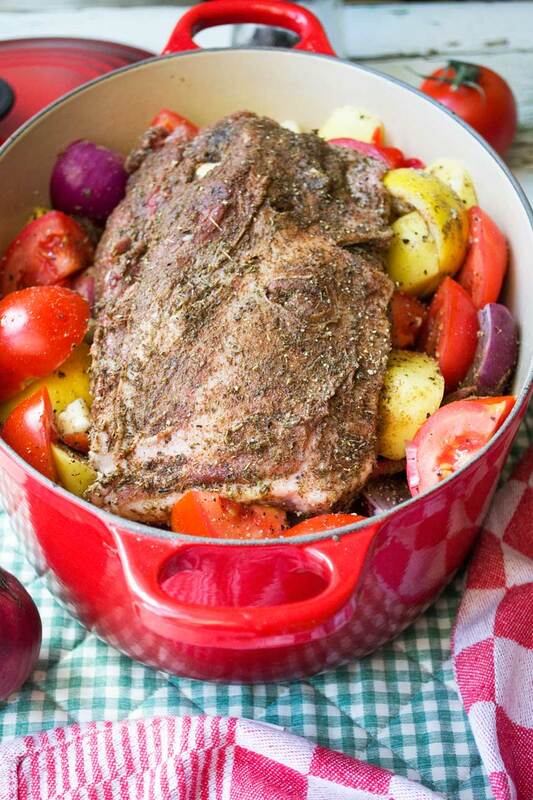 Sit the lamb on top of the veggies (a Le Creuset Dutch oven or similar is perfect! ), and pop into the oven for about 4 hours while you plop yourself on the sofa with your Netflix series of choice. And there you go. Entertaining perfection. This is what your Greek lamb looks like before going in the oven! The only attention this meal needs is a little check of the amount of water as it cooks. I found that there was still plenty of liquid in there half way through cooking, but I needed to add a big splash or two about two thirds of the way through – and then again before taking off the pot lid and letting the veggies cook uncovered for fifteen minutes at the end. Lamb kleftiko doesn’t have a gravy as such, but you do want plenty of tasty juices to mop up with some fresh crusty bread. This traditional Greek lamb dish packs in plenty of lemony, garlic-y, oregano-y, cinnamon-y flavour – especially considering the small number of ingredients you use. Just perfect for those winter days when you really don’t want to leave the couch, let alone the house, but still want to convince yourself and others that you did something with your day. In this case, cook a meal worthy of a (Greek) king! 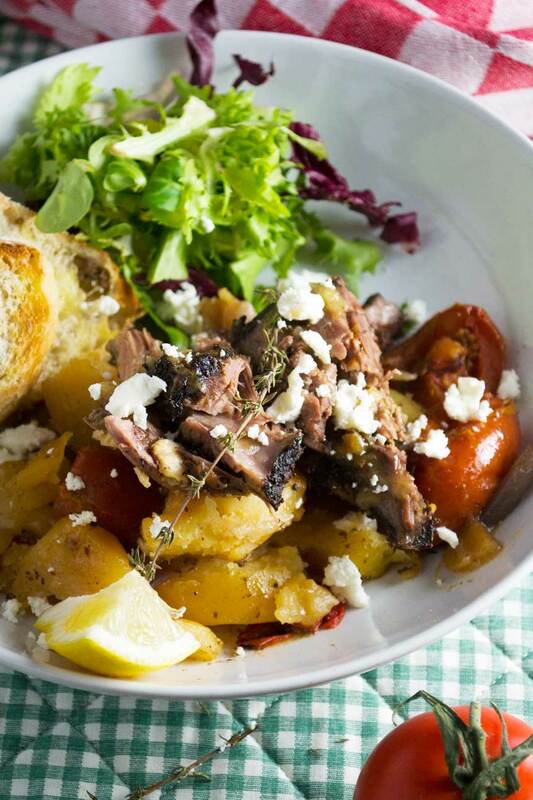 A super flavourful not to mention really easy to make impressive Greek lamb roast. Throw a few ingredients in a pot, sit a lamb leg on top, rub in herbs and spices, and slow roast to entertaining perfection. Preheat the oven to 160C / 320F. Place the potato wedges, tomatoes, red pepper, onions, and bay leaves in an oven proof cooking pot or deep roasting pan. Grind over plenty of salt and pepper, then sit the lamb on top, fat side up. Rub the lamb all over with the olive oil, then with the oregano and cinnamon. Squeeze over the juice of half the lemon. Peel half of the garlic cloves and roughly chop into chunks. Cut small slits all over the lamb and insert the garlic chunks into them. Tuck the rest of the garlic (unpeeled is fine) in and around the lamb and potatoes / veggies, then squeeze the other half of the lemon all over the potatoes / veggies. Finally, pour over 200ml water. Put the lid on the pot (or tightly cover with foil if using a roasting dish) and roast for 4 hours until the lamb is fall-apart tender. Check half way through cooking, and again about two thirds of the way through, and add a few drizzles more water if you think the dish needs it. Fifteen minutes before the end of the cooking time, add another splash or two of water if necessary, then turn the oven up to 220C / 430F and roast uncovered until the potatoes / veggies have browned a little. Remove the bay leaves, then serve with a sprinkle of feta, Greek yogurt, grilled bread and salad (if using). What a wonderful alternative to a turkey! This would make a fantastic Christmas dinner as well! 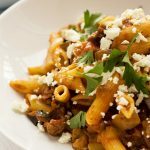 My husband and I are huge fans of lamb and since I’ve been pregnant, I’ve been craving Greek/Mediterranean food like crazy! Awesome dish, Helen! That’s one of the most interesting craving’s I’ve heard of! Wish that’s what I had – I’m eating rather too much chocolate these days! 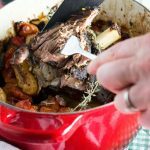 I love a good slow cooked lamb dish and I’m going to try this the next time I make lamb. Hi Janette – do let me know how it turns out! Wow, your lamb is cooked to perfection! Bill adores lamb, my repertoire is limited to a roast leg of lamb or grilled lamb chops. Your Greek lamb sounds scrumptious!! Hi Liz! Thank you and I really hope you treat your hubby to this some time. I do think he’d love it if he’s a fan of lamb! My mouth was watering just reading through your post! 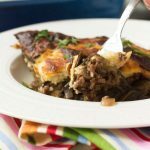 I love these sorts of recipes – simple but full of flavour. And the weather is perfect now for a slow cooked dinner. Hi Nancy! Thank you! I really hope you give this a go some time. You’re right that it’s a real winter warmer! The first time I tried lamb, I was in my 30s. Now I absolutely love it – chops, burgers, shredded, you name it! And I love dishes like this that are melt-in-your-mouth delicious and are set and forget. We got our first skiff of snow this morning and this is just the kind of meal I’m craving! Snow? Wow! Lucky you – definitely time to get the winter warmers out then! Love leg of lamb and you’ve cooked this one perfectly! Looks mouthwatering! Just made lamb chops the other day, but need to try this very soon! Pinned and shared! Hope you are doing well Helen! Thanks Mira! I’m doing great, thanks – hope you and the family are well too! This was delicious! We buy a whole organic lamb each year. Some of the cuts we get are not the kind you would look for in a grocery store so sometimes I have to improvise. I had a shoulder roast about 2 lbs that worked out very well in this recipe. Thank you so much for sharing it. Hi Rita. Thank you so much for taking the time to leave your (great!) feedback. A whole organic lamb sounds just fabulous, and really reminds me of my days in Greece. I’m so glad you enjoyed this recipe. 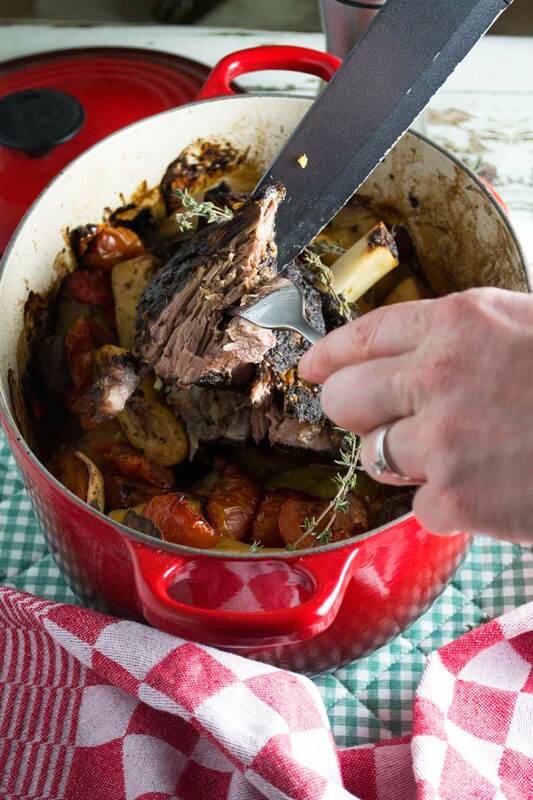 For me the slow-cooked Greek way is the only way to eat lamb! I totally agree, Maggie – it’s slow-roasted lamb all the way for me! 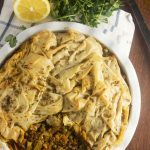 I’m planning to try cooking kleftiko this weekend, but I have a question. Your photos show what looks like fresh thyme, but it’s not in the recipe ingredients. Is that really thyme? Did you use that AND oregano? Hi Jon, really pleased you’re going to give this one a try! I find it absolutely delicious and I really hope you agree! As for your question, ahhh… you got me! I did in fact add a bit of fresh thyme, which by all means you can do too, but traditionally kleftiko doesn’t have thyme in it. I just added it because I happened to have it at home and I thought it would look pretty in the pictures. If you remember, do let me know what you think of the dish! Lamb with garlic potatoes sounds positively delightful! I was just looking to try something new for Easter and I think this will be a winner! Thanks Jessica – I really do hope you try it. Slow cooking is truely the way to go with lamb! I love lamb and the flavors in this! Can’t wait to try this! Hi Amy – I hope you do! It’s delicious, and Easter is the perfect time to try it. I love a meal that incorporates a Netflix binge in the cooking process. 😉 This is the kind of meal I’d be intimidated by preparing at home, but your instructions make it sound pretty simple. A perfect special occasion meal! What I didn’t admit to in the post is that this is the ONLY lamb recipe on the blog. I’m SO not usually a ‘big slab of meat’ cook, but honestly this one is both easy peasy and worth it. So glad I made it sound simple, Alyssa! I have done this before and have it in my slow cooker at the moment. It’s absolutely amazing! If I have left overs I chip the potatoes up and do individual pies made with filo pastry (had it this way in Greece once) so very yummy! Hello Natasha! I’m so happy you enjoyed this… and to hear that you cooked it in the slow cooker! Does it still brown? Fabulous idea to make little lamb pies with the leftovers too. I’m definitely going to do that next time. Mmmm!